General Characteristics: Medium in height to tall, slender, erect, maturing within 8 to 12 months, producing from 2 to 5 oha; distinguished by the dark green petioles which are shaded with purple, especially near base and along margins. Petiole: 75 to 100 cm. long, dark green with purplish shading especially near base and along margins, purple at apex, with a narrow dark reddish to purplish-black edge, a dark reddish-purple ring at base with lighter reddish-purple for 3 to 5 cm. above. Leaf blade: 45 to 55 cm. long, 30 to 35 cm. wide, 35 to 45 cm. from tip to base of sinus, sagittate, drooping, dark green; piko small, dark purplish; lobes acute with deep, narrow sinus. Corm: Flesh lilac-purple with darker reddish-purple fibers; skin brilliant reddish-purple; roots light reddish-purple. 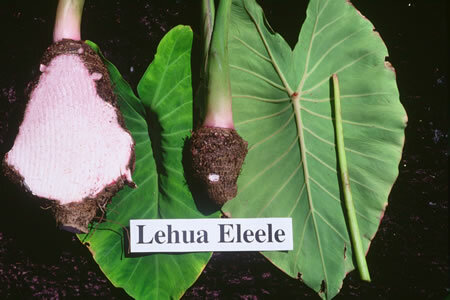 Origin, and derivation of name: Native variety; the name Eleele is probably given to this variety because it has much darker colored petioles than other Lehua varieties, although the petioles are far from being blackish. This variety is known as Wailana in Kona, Hawaii. Distribution: Planted quite extensively in Kona, Hawaii, usually under upland culture, but practically none is grown elsewhere. Use: Makes a very good red poi. Remarks: This is an early-maturing taro of high yielding capacity. It must be harvested as soon as it is mature as it rots readily if held in the field for any length of time.